Sorry. No last minute entries from United Artists or Universal – sparing the Academy from screening any DePatie Freleng Blue Racer or Walter Lantz Beary Family cartoons this time around. The Hollywood studio short was dead and buried. That said, the Oscar wasn’t exactly handed to an indie filmmaker from the midwest, the National Film Board of Canada, or some depressing film produced behind the “iron curtain”. It was in fact given to a film produced by veteran Hollywood animator Chuck Jones, and directed by the internationally renown Richard Williams. It was also the last year animation entries could even qualify under “Short Subjects”. The term “Short Subject” had by now become obsolete. Beginning next year it was tweaked – animation would simply fall under the ‘Best Short Films’ heading. One of Mike Jittlov’s earliest student films. Perhaps a bit too amateur for an Academy nomination, but you can sense something is there – and Jittlov would be back. I’m not saying Disney made the definitive animated version of The Legend of Sleepy Hollow, but heck, you gotta do better than this low budget, aimed strictly for showings in English classes, version of the tale. John Carradine brings a bit of class to it as narrator. Bill Davis’s drawings are good – but, like last years Bosustow submission Freedom River, his designs seem “mis-cast” for such a dark tale. Now THIS Bosustow production was worthy of an Oscar nomination. Sensitive adaptation of Shel Siverstein’s classic illustrated book – which has been interpreted in many ways (positively and negatively) by many people and religious groups. Nonetheless the story has become a classic and this animated version, based on Silverstein’s drawings, and with Silverstein himself reading the text, works perfectly. Oscar-snubbed, to be sure! First of all – if you watch only one cartoon in this post this week, Super Joe is the one to watch. This is a real candidate – not for an Oscar – but to win a slot in my WORST CARTOONS EVER screening next July at Comic Con. Produced by Al Guest (Rocket Robin Hood), an animation producer, second to Sam Singer, known for his notoriously bad cartoons – and financed by Larry Spangler (producer of “The Joe Nameth Show” and later, a series of blax-ploitation movies in the 1970s). “Super Joe” Nameth was a huge American football star and charismatic actor of the 1960s and early 70s. Why this film was made exactly, I do not know – but its an early production by Patrick Laubert and Michael Hirsh (as Laff Arts, soon to become Nelvana). The film even includes some of the earliest professional work by Frank Nissen and Marv Newland! This film is hilariously bad – must-see “bad”. I’m grateful to JJ Sedelmaier for digging this up and posting it online exclusively for this post. JJ – You’ve made my day! A parody of Frankenstein films, in which a baker creates a huge chocolate cake that comes to life and eats its creator. FREE – This one is a complete mystery to me. My educated guess is that it’s a student film. Mark Kausler has a print of this! See comments below! UPDATE: Eureka! See commentary below for notes on The Mad Baker and Free. The earlier posts in this series: 1948, 1951, 1952, 1953, 1954, 1955, 1956, 1957, 1958, 1959, 1960, 1961, 1962, 1963, 1964, 1965, 1966, 1967, 1968, 1969, 1970 and 1971. FWIW, “The Mad Baker” opened 20 Dec. 1972 at the Crest Theatre, Westwood. One man who refuses to conform to the traditional seven-minute running time for a cartoon, or to their usual lightweight family subject matter, is former comic Len Maxwell. And his first effort, made in association with partners Ted Petok and Joe Petrovich, “The Crunch Bird,” has not only proven a financial success but has been nominated for an Academy Award in the “animated short subject” category. The short is being handled nationally for distribution by Herb Gillis’ Detroit-based Regency Film Distributing for the next seven years. Although the deal with Regency is for the one short, Maxwell-Petok-Petrovich is so happy with the results that Maxwell says that they’ll go right along with Regency on their next efforts. The completed, but unreleased, followup, ‘The Mad Baker,” goes the other extreme and runs nine-and-a-half minutes, overlength for a cartoon. Maxwell, whose ability with voices has come in very handy over the several years he has been voicing commercials, described it as a high-caloric spoof of the Frankenstein-Dracula-type horror stories and more suited to general family audiences than the very adult “Crunch Bird.” Other projects, in various stages of animation or story planning, include “Yech!,” another briefie, and four more originals. Maxwell, of course, does all the voices. Thanks Yowp. I guess I should have made it clearer that I had much of this information (and I should have posted it)… It’s the film, The Mad Baker, itself I couldn’t find. But I’m happy to leave things as it is – and let your contribution to this post’s research stand. You’ve become a real champ at digging through the trades for bits of obscure info – the Cartoon Research community salutes you! Len Maxwell worked on “Batfink,” didn’t he? Thanks again for sharing! I don’t really agree with you on ‘Super Joe’, however. I’d never heard of this cartoon before, but after watching it I find it a pleasantly typical product of the early seventies, with its groovy atmosphere and stream-of-consciousness-like gags. I certainly have seen (many) worse cartoons than this one. Definitely resembles something of a vehicle for Namath’s celeb status if that’s what they were going for here. One big advertisement wrapped up in animated, yet surreal short. I’m with you on this one, Gijs. Personally, though, I saw it as a satirical parable on the preconceived notions about (and burdens of) celebrity. Actually, I don’t think this was that bad. It’s as the others said very much time piece if you like-Namath was a stupidly popular figure in the late 60’s early 70’s, I liked the references to Howard Cossell and whatever else. It’s not GOOD, mind you, but–I’ve seen worse. They did too many of these Yellow Submarine type things as you can no doubt tell. I earlier noted that Detroit filmmaker Ted Petok’s THE CRUNCH BIRD received numerous area theatrical screenings in the city back in the day. After Petok won the ’71 Oscar, his follow-up film, THE MAD BAKER, was even prominently featured in local movie theatre ads when it was released. But lightning didn’t strike twice. The short was only fitfully amusing — granted, it’s a little hard to remember much more than its carnivorous chocolate cake after forty-five years — and wasn’t a great audience-pleaser. The style and design was similar to THE CRUNCH BIRD and it was a little more ambitious and elaborate than the earlier picture (and it was longer than two minutes). But the cartoon failed to make much of an impression; it didn’t receive anywhere near the local bookings as Petok’s earlier hit. I guess sometimes it’s hard to branch off from where you started from. THE MAD BAKER is credited to Ted Petok on the Big Cartoon Database. https://www.bcdb.com/cartoon/57943-Mad-Baker I have the feeling somebody else here will give the same information before my post appears online. I didn’t think SUPER JOE was that bad since the animation is quite groovy and typical of the era. However it is regrettably a product of its time and very sexist in tone with an emphasis on “big” Joe’s masculinity and ladies’ bosoms. Intriguingly, some of Universal’s final “short subject” offerings of 1971-72 season that were NOT Walter Lantz cartoons are worth psychological study in this regard: a live-action sports-reel TRANS-AM CHALLENGE inter-mixes shots of Mark Donohue and George Folmer car scenes with “cleavage” shots of lady spectators. Since both Women’s Liberation and especially Gay Liberation were front page news by 1971 (and movies involving the latter like SUNDAY BLOODY SUNDAY and BOYS IN THE SAND were cresting in popularity), there might have been a backlash among some male film makers super-sensitive that their own “orientation” might be questioned. This also applied to animation as well since Fritz the Cat stayed completely focused on just one gender and every female “funny” animal is quite blessed in a bosomy way. 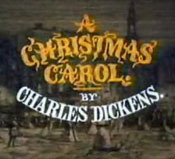 I remember that A Christmas Carol was shown on ABC during the Christmas season months before it was nominated and later won the Oscar for best animated short. Heard that it it raise so much of a stink by industry insiders because it was shown on Network television before it was released in theaters that AMPAS decided to charge its policy by disqualifying any future animated works that’s initially shown on television. Nevertheless it was a beautiful work of animation art and was worthy of winning the Oscars for best animated short. Wasn’t Wallace and Gromit’s shorts shown on the BBC first (with the execption of “A Grand Day Out”) before winning Oscars? Yes they did which also included The Gruffalo and The Snowman that were shown on British TV first and later released into theaters across the pond. THE MAD BAKER is one of a handful of Ted Petok shorts for direct sale (at the link http://www.crunchbirdstudios.com/Videos.htm) by Petok’s son Fred. (I knew Petok when I was a kid—he was kind and invited me to his studio and teach me how scenes go from storyboard to layout to final scene and how to read an X-sheet.) If not widely known now, he was for a time something of a Detroit legend after his 1971 Oscar win with THE CRUNCH BIRD. He was of a generation of ex-Jam Handy guys who started their own shops. His boutique studio mainly did animated commercials and some spots for SESAME STREET and ELECTRIC COMPANY. Okay, “Super Joe” was amazing. Any more praise for Joe Namath, and he would’ve achieved deity status. As bad as the ’70s were in animation, at least there were a couple of bright spots. “A Doonesbury Special” was nominated for the Oscar for Best Animated Short of 1977, and I had thought that it had premiered on television. Did it actually play in theaters first? It had to play theatrically to qualify…. probably for a week at a local LA movie house. I believe John Hubley’s THE DOONESBURY SPECIAL was nominated by his fellow Academy shorts branch members solely as a final tribute to him (he passed away during its production). Also, THE DOONESBURY SPECIAL wasn’t the only TV Special to be submitted that year. Nelvana’s A COSMIC CHRISTMAS was also entered in the race. It should also be mentioned that some British shorts nominated (and a few that won) first aired on TV in the UK, but premiered theatrically on the US. For example, the Wallace and Gromit shorts and The Gruffalo. Many UK shorts and specials produced for channels like the BBC and Channel Four often had film festival screenings and other theatrical avenues beforehand when they received the Oscar nomination here. At least it’s one grey area they can exploit! 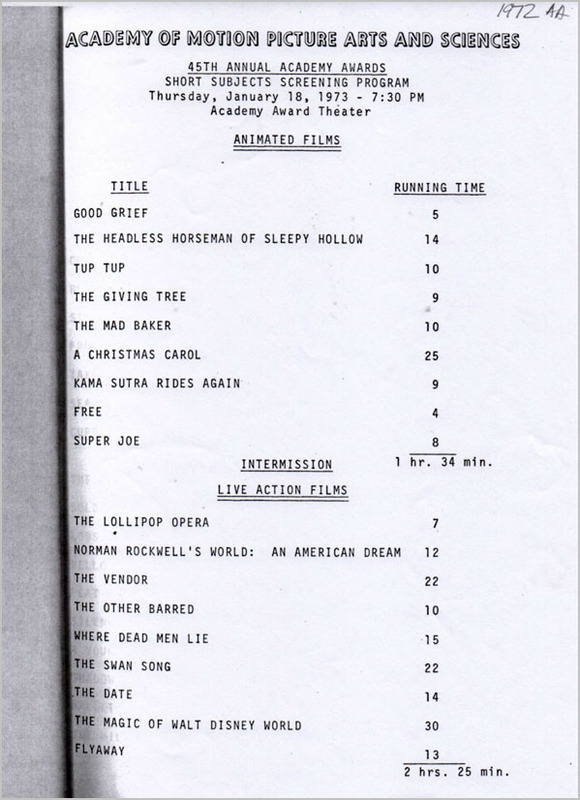 Seemed like the Academy learned quite a bit between 1972 and ’73, namely two things, to actually WATCH the nominated shorts before they gave their verdict, and not not accept TV productions unless debuted theatrically such as in the LA area. I vaguely remember seeing “Good Grief” on TV (I certainly remember the twist ending), but seeing it again, I am impressed with the direction and some of the animation. “Super Joe” looks like a high-schooler’s film project. Hard to believe it was done by a professional studio, much less submitted for the Oscars. As such, it has a certain naïve charm. And yet Jittlov went to UCLA to major in Math before switching over to animation. In the early 1980’s, Nickelodeon used to run “Good Grief” as filler in between programs or other films during the day and I often saw it pop up a lot. I do remember being pretty bugged out by the visual imagery and the kid falling out of his own bedroom in the end. Right down to the tape spliced edits! I couldn’t tell if this was a workprint or a final copy that way. Found this interview with Mike Jittlov, where he talked about “Good Grief” and its subsequent submission to the Academy. The film was shot on 16mm, but they blew it up to 35mm so they could submit it for Oscar consideration. But he surmounted the impossible (“A rack, to the fifth power.”) and didn’t stop until it was done on time and done completely. (“In other words, totaled.”) UCLA was not merely impressed; they blew it up to 35mm for entry into the Academy Awards’ Animation category. As there was then no student film section, Mike’s one-man production was contending with over a hundred films from around the world, many from major studios. Nevertheless, our hero made it to the finals-one of only nine films so honored. That was certainly an impressive feat (moreso than Jittlov’s claim to the “Smiley Face” logo he created long before the “Have A Nice Day!” meme happened). If the Animated Short Subject category was dropped after this year, does this mean this series is at an end? If so, it’s been great to learn about this corner of animation history. Hopefully some day the documentation for 1949 and 1950 will turn up, just fill the gap. We will have a column on the 1973 submissions next week – but to be honest, I may stop (or modify) these posts from here on out. Starting in 1974 the submissions suddenly rose to over 30 shorts each year. I’ll make a decision on this in the next week or so. That would be sad if it’ll stop for now, I was getting to enjoy this a lot! The Academy has never entirely dropped the category for animated short films since the category began; they’ve just changed the name of the category. Well, if you won’t, I will! No one will ever top that “Midnight Ride” sequence. If anyone can direct me to any other ads in this series that have been uploaded, or perhaps Mike Kazaleh or one of the other editors here can devote an article on either just this series of TV ads or, at least, on the history of Looney Tunes commercial association with Yellow Pages (Bugs has been featured in quite a few early ones) that alludes to the series, I’d be ever so grateful. Jerry: We have the Mad Baker and can I tell you stories about it. Personally it is my favorite. It will not be available for posting but can be obtained for personal use along with other classics including original cells.